THE morning after the fight between Jenny and Mr. Wren and Bully the English Sparrow found Peter Rabbit in the Old Orchard again. He was so curious to know what Jenny Wren would do for a house that nothing but some very great danger could have kept him away from there. Truth to tell, Peter was afraid that not being able to have their old house, Jenny and Mr. Wren would decide to leave the Old Orchard altogether. So it was with a great deal of relief that as he hopped over a low place in the old stone wall he heard Mr. Wren singing with all his might. The song was coming from quite the other side of the Old Orchard from where Bully and Mrs. Bully had set up housekeeping. Peter hurried over. He found Mr. Wren right away, but at first saw nothing of Jenny. He was just about to ask after her when he caught sight of her with a tiny stick in her bill. She snapped her sharp little eyes at him, but for once her tongue was still. You see, she couldn't talk and carry that stick at the same time. Peter watched her and saw her disappear in a little hole in a big branch of one of the old apple-trees. Hardly had she popped in than she popped out again. This time her mouth was free, and so was her tongue. "You'd better stop singing and help me," she said to Mr. Wren sharply. Mr. Wren obediently stopped singing and began to hunt for a tiny little twig such as Jenny had taken into that hole. "Well!" exclaimed Peter. "It didn't take you long to find a new house, did it?" "Certainly not," snapped Jenny "We can't afford to sit around wasting time like some folks I know." Peter grinned and looked a little foolish, but he didn't resent it. You see he was quite used to that sort of thing. "Aren't you afraid that Bully will try to drive you out of that house?" he ventured. Jenny Wren's sharp little eyes snapped more than ever. "I'd like to see him try!" said she. "That doorway's too small for him to get more than his head in. And if he tries putting his head in while I'm inside, I'll peck his eyes out! She said this so fiercely that Peter laughed right out. "I really believe you would," said he. "I certainly would," she retorted. "Now I can't stop to talk to you, Peter Rabbit, because I'm too busy. Mr. Wren, you ought to know that that stick is too big." Jenny snatched it out of Mr. Wren's mouth and dropped it on the ground, while Mr. Wren meekly went to hunt for another. Jenny joined him, and as Peter watched them he understood why Jenny is so often spoken of as a feathered busybody. For some time Peter Rabbit watched Jenny and Mr. Wren carry sticks and straws into that little hole until it seemed to him they were trying to fill the whole inside of the tree. Just watching them made Peter positively tired. Mr. Wren would stop every now and then to sing, but Jenny didn't waste a minute. In spite of that she managed to talk just the same. "I suppose Little Friend the Song Sparrow got here some time ago," said she. You can tell him from other Sparrows by the white outer feathers in his tail. His tinkling, happy song can never be mistaken. Peter nodded. "Yes," said he. "I saw him only a day or two ago over by the Laughing Brook, and although he wouldn't say so, I'm sure that he has a nest and eggs already." Jenny Wren jerked her tail and nodded her head vigorously. "I suppose so," said she. "He doesn't have to make as long a journey as we do, so he gets here sooner. Did you ever in your life see such a difference as there is between Little Friend and his cousin, Bully? Everybody loves Little Friend." Once more Peter nodded. "That's right," said he. "Everybody does love Little Friend. It makes me feel sort of all glad inside just to hear him sing. I guess it makes everybody feel that way. I wonder why we so seldom see him up here in the Old Orchard." "Because he likes damp places with plenty of bushes better," replied Jenny Wren. "It wouldn't do for everybody to like the same kind of a place. He isn't a tree bird, anyway. He likes to be on or near the ground. You will never find his nest much above the ground, not more than a foot or two. Quite often it is on the ground. Of course I prefer Mr. Wren's song, but I must admit that Little Friend has one of the happiest songs of any one I know. Then, too, he is so modest, just like us Wrens." 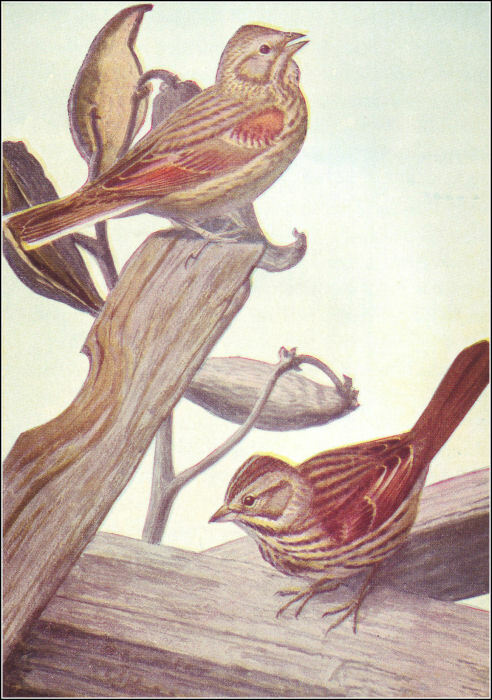 Peter turned his head aside to hide a smile, for if there is anybody who delights in being both seen and heard it is Jenny Wren, while Little Friend the Song Sparrow is shy and retiring, content to make all the world glad with his song, but preferring to keep out of sight as much as possible. Jenny chattered on as she hunted for some more material for her nest. "I suppose you've noticed, said she, "that he and his wife dress very much alike. They don't go in for bright colors any more than we Wrens do. They show good taste. I like the little brown caps they wear, and the way their breasts and sides are streaked with brown. Then, too, they are such useful folks. It is a pity that that nuisance of a Bully doesn't learn something from them. I suppose they stay rather later than we do in the fall." "Yes," replied Peter. "They don't go until Jack Frost makes them. I don't know of any one that we miss more than we do them." "Speaking of the sparrow family, did you see anything of Whitethroat?" asked Jenny Wren, as she rested for a moment in the doorway of her new house and looked down at Peter Rabbit. Peter's face brightened. "I should say I did!" he exclaimed. "He stopped for a few days on his way north. I only wish he would stay here all the time. But he seems to think there is no place like the Great Woods of the North. I could listen all day to his song. Do you know what he always seems to be saying?" "I live happ-i-ly, happ-i-ly, happ-i-ly," replied Peter. "I guess he must too, because he makes other people so happy." Jenny nodded in her usual emphatic way. "I don't know him as well as I do some of the others," said she, "but when I have seen him down in the South he always has appeared to me to be a perfect gentleman. He is social, too; he likes to travel with others." "I've noticed that," said Peter. "He almost always has company when he passes through here. Some of those Sparrows are so much alike that it is hard for me to tell them apart, but I can always tell Whitethroat because he is one of the largest of the tribe and has such a lovely white throat. He really is handsome with his black and white cap and that bright yellow spot before each eye. I am told that he is very dearly loved up in the North where he makes his home. They say he sings all the time." "I suppose Scratcher the Fox Sparrow has been along too," said Jenny. "He also started some time before we did." "Yes," replied Peter. "He spent one night in the dear Old Briar-patch. He is fine looking too, the biggest of all the Sparrow tribe, and how he can sing. The only thing I've got against him is the color of his coat. It always reminds me of Reddy Fox, and I don't like anything that reminds me of that fellow. When he visited us I discovered something about Scratcher which I don't believe you know." "What?" demanded Jenny rather sharply. "That when he scratches among the leaves he uses both feet at once," cried Peter triumphantly. "It's funny to watch him." "Pooh! I knew that," retorted Jenny Wren. "What do you suppose my eyes are made for? I thought you were going to tell me something I didn't know."